All who knew Helen Nobel would agree that she was the heartbeat of wherever she went. She was vibrant, vivacious, and spunky with the best sense of humor and most amazing and vivid stories that were simply captivating to hear. Helen’s capacity to love was beyond extraordinary, In fact, it has been said that her life was one big love story. A devoted wife beyond measure, she considered it her highest calling to be a wife, mother, grandmother, and great-grandmother. 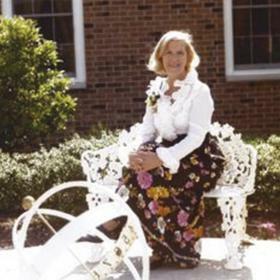 Social and outgoing, Helen was a lifelong resident of the community she loved and someone that everyone seemed to know. Life will never be the same without Helen here, but she leaves behind a timeless legacy that her loved ones will proudly carry on in her footsteps. It seems only fitting that Helen’s journey began during a time that was as vibrant as she was and filled with lots of baseball, the peak of Broadway, and motion pictures in both color and sound. It was on June 5, 1920, that Orrin and Cornelia (Kate) Parsons were blessed with the birth of the baby girl they named Helen Elizabeth in Grand Rapids, Michigan. She was raised in the family home in East Grand Rapids near Reeds Lake and Ramona Park. Helen’s father was a bricklayer while her mother was a seamstress. She adored her parents and was also great friends with her sister throughout her life as they often talked every day. Helen was particularly close to her father who was a talented artist. She cherished all of the paintings, artwork, and diaries he left her for the rest of her life. Helen enjoyed learning to bake from her mother, and she used these skills well into her adult years. She wrote poetry, enjoyed reading, regularly attended dances, and often hung out at Ramona Park. Helen attended local schools and was president of the newspaper club in high school. New and exciting changes were in store for Helen when she met the young man of her dreams. His name was Bill Meyers, and it was easy for him to see how beautiful she was - both inside and out. He lived in the neighborhood, and they were introduced by friends. Smitten, Bill was relentless in his pursuit of Helen, even hiding in the bushes to surprise her when she walked past! Persistence paid off since the couple was married for what would become more than 45 years. Together they welcomed three boys, Bud (Buddy), Gary, and James (Jim) into their hearts and home. They made their home in East Grand Rapids, and Helen loved her boys fiercely and was very close to them. Her family appreciated her fantastic cooking and baking skills, and she loved regularly entertaining their many close, lifelong friends. Together Helen and Bill owned and operated a photography studio located on Plainfield Avenue and were especially known for taking school photos throughout the area. Helen was the one who managed all the books for the business. They did enjoy time away, too, traveling all over the country when their boys were young and also taking several family vacations. Throughout her life Helen was a woman with many interests. From the time she was young she enjoyed writing poetry, and she also loved reading non-fiction and historical books, especially about the Revolutionary War. Helen also kept up on current events and could have an intelligent conversation on any topic. She was was well known for her funny and interesting stories as well as her amazing sense of humor! It was commonly known that if you were around Helen, you would be laughing more than anything else! She also had a great memory, even when she was in her nineties. Until her death, Helen was able to rattle off dates, even the time of day in the stories she told like it was yesterday rather than something that happened several decades ago. Perhaps the most amazing thing about Helen was her capacity to love and selflessly give to others. She tenderly cared for Bill as he battled cancer until his death. 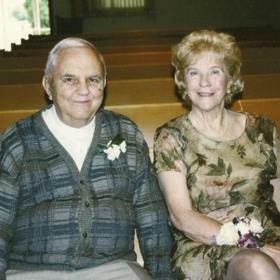 She then married a longtime friend, Lou Mahacek, caring for him until his death. Then, Helen was reunited with her former high school sweetheart, George Wheeker, and they were married him in a ceremony at the age of 78! He developed Parkinson’s, and Helen cared for him until he passed away several years later. Their time together was short but sweet, and it was easy to see that George cherished her. Shortly thereafter, Helen met her fourth husband, George Nobel, and they enjoyed over 15 years together. Although he was 10 years her junior, it was amazing to see that she had the energy and stamina to keep up with him. 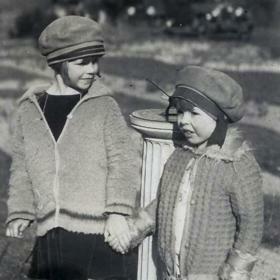 Helen and George lived in Jenison, but they spent summer weekends at their cottage near Silver Lake and winters near Fort Lauderdale. The love Helen had for others extended to everyone. In addition to deeply loving all of her husbands, she loved her children, grandchildren, and great-grandchildren. 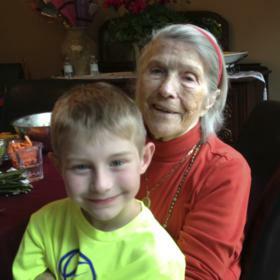 She never ran out of energy for keeping up with what was going on in the lives of her grandchildren and great-grandchildren and was so proud of each and every accomplishment. Helen was unassuming, never expecting anything, and she was always grateful when anyone did something for her. With unending love for all who were near, Helen Nobel was a blessing in the lives of everyone she met. She had a magnetic personality and an unending ability to selflessly give of herself with energy that never ran dry. Helen was deeply devoted to her family, and there was nothing she treasured more than being surrounded by their love. She will never be forgotten. NOBEL (Meyers, Wheeker, Mahacek)– Helen Elizabeth Nobel, age 97 of Algoma Twp., passed away peacefully, surrounded by her loving family, on February 3, 2018. She was preceded in death by her infant brother; parents, Orrin & Cornelia (Kate) Parsons; husbands, William Meyers, Lou Mahacek and George Wheeker; sons, Bud Meyers and Gary Meyers; and sister, Clarissa (Gene) Gleason. Helen is survived by her husband, George Nobel; son, James (Barb) Meyers, daughter-in-law, Connie Meyers; grandchildren, William Meyers, Amy Meyers, Dustin (Sarah) Meyers, James (Jenny) Meyers, Carrie (Tim) Meyers, Chris (Lisa) Meyers, Dallas Meyers, Tereasa Johnson, and Nick Meyers; 33 great grandchildren; many very dear nieces and nephews, as well as step-children and friends. 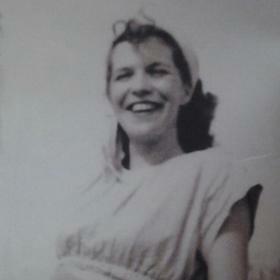 Helen was born June 25, 1920 and grew up in East Grand Rapids, near Reeds Lake. She had many fond memories of her childhood and youth, especially with her beloved parents and her sister, Clarissa, who remained her best friend into adulthood. Helen had a way with words and a keen intellect; she loved sharing stories, writing poetry and essays, and was an avid reader who thoroughly enjoyed history and genealogy. She also loved to travel and entertain, and was known to be a fantastic cook and a stylish dresser. Helen managed a photography studio with her first husband, Bill, for many years, but her primary devotion was to her family. She had a special bond with her three sons, cared for four wonderful husbands, and dearly loved her grand-children and great-grandchildren. Helen remained active and healthy all through her life, and dedicated her most recent years to time with her husband, George. Helen will be best remembered for her sharp mind, amazing sense of humor, positive outlook, abundant energy, and her “spunky” personality; all which stayed with her to the very end. She was a beautiful person, inside and out, who lived life to the fullest and was well-loved by all who had the privilege to know her. The Funeral Service will be held at 11 AM on Thursday, February 8, 2018 at North Park Presbyterian Church, 500 N. Park St. NE. Family and friends will gather together from 6-8 PM on Wednesday, February 7, 2018 at Heritage Life Story Funeral Homes, 1833 Plainfield NE and for one hour prior to the service at church. Please visit www.lifestorynet.com to read Helen’s lifestory, archive a memory, photo, or to sign the guestbook online.